After a really rough night at anchor with zero protection from the SE wind and swells, we decide we need a night at a calm protected mooring. We’re trying to find someplace that will be an easy dinghy ride to meet up with David & Amy Kniffin, my friends from Yale. I try phoning places from the cruising guide with no luck. 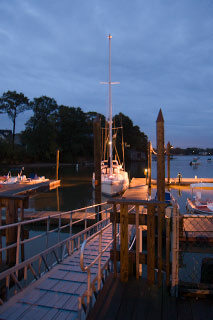 Megan calls Greenwich Boat and Yacht Club on the radio and gets an immediate response that they have moorings and can accommodate us (“just call us when you get here”). We quickly get underway and motor 8 miles through rain, wind and seas. The short trip is more exciting than we wanted since against our first instincts we tow the dinghy and don’t pull it up on the davits. The swells remind us not to us underestimate Long Island Sound and the dinghy spends the next hour sailing past us then snapping back on its painter. Luckily it does arrive in Greenwich with us. However, the Greenwich Boat and Yacht Club doesn’t answer when we arrive… but plenty of jokers on 12 meter racing boats getting ready for a race are on the radio. We begin to suspect someone was playing a very ugly joke on us since no moorings are available anywhere. And we certainly look out of place with our kid-friendly, lifeline-netted cruising boats among the half million dollar 12 meter racing boats and Henri Lloyd outfitted crews. The kids are sick and we are sleepless, wet and angry. I start phoning more marinas. 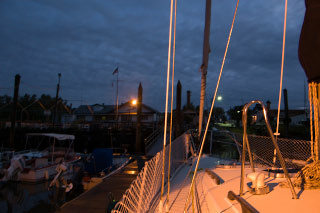 A thick New York accent at Port Chester Yacht Club answers, “No we don’t have any moorings for transients.” Frustrated I ask if they know anyone who might… and I play the kid card, “we’ve got a couple small kids on board and just want to find a place to get a break from the weather.” On the other end of the line I hear, “It’s a husband and wife with a couple kids, can we help ‘em out?” Then, “Come on in and grab any mooring… or why don’t you just come into the dock.” We motor a few miles to Port Chester and start heading up a stream. There in the rain are 3 rough looking guys standing on docks filled with 14’-18’ weekend fishing boats. I call on the phone for instructions and also ask, “by the way, what are your rates?” Billy, with a long white beard and yellow rain slicker who will later introduce himself as the “Commodore,” answers “What rates? 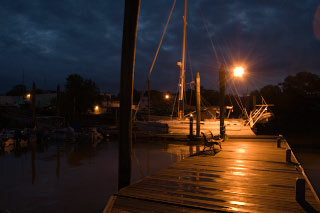 You’re our guests.” After helping us dock, Billy introduces himself, Sal – the “Vice Commodore” – and Ronny – a “member.” He tells us to help ourselves to the water and electrical hookups and to feel free to use the clubhouse which they leave open for us. Later I take the boys and walk out the road. 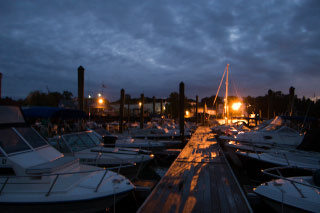 The Yacht Club is located directly behind the Port Chester waste management facility (you can see the incinerator stack over the clubhouse)… And the club and its members couldn’t be nicer. We’ll take Port Chester over Greenwich anytime! 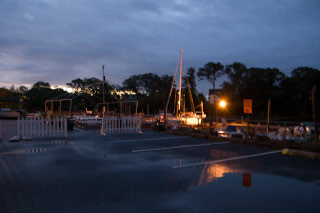 As I walk back to the boat I see Ronny working on one of the many boats in the parking lot that appear to be damaged. He tells me a freak storm hit a week earlier and took out a number of boats (75mph sustained winds, 8’ waves inside the protected harbor, and a high tide held in by the wind for 2 days). I tell him how grateful we are for the club’s hospitality. He says not to worry “Billy & Sal can be kind of rough guys… but if Billy say’s you’re good… you’re good.” Thank you PCYC! With Grace safely docked, we greet Amy Kniffin who arrives with daughter Nelle (just a month younger than Finn). Finn and Nelle hit it off and he gives her the grand tour. Amy drives us back to her house in Darien and very graciously lets us do laundry and take showers. Her sons Jack and Peter come home from school. David returns from work and we are treated to a really nice meal with the Kniffin family. The night ends too soon since we have an early day to make the fair currents through Hell Gate into NYC the following day. Dave gives us a ride back to our fair haven of Port Chester. Now its my turn to lead a boat tour for Dave which covers all the gadgets we get to play with (and fix) everyday.